*UPDATE: Another incident occurred on June 30th. That brings total number of shootings in June to 34. In the last week of June there were 14 shootings – 14 shootings in 7 days. As June draws to a close, once again there were more kids shot as a result of negligently stored firearms (33) than there were days in the month. This month also saw two incidents where a child unintentionally shot an adult, in one case killing the adult. In the last week alone, there were at least 13 shootings that were the direct result of an adult’s careless choice to leave their firearm unsecured. Of those 13 shootings, three resulted in a fatality. In one case, an 11-year-old in Montgomery, Alabama child was playing with a gun and unintentionally shot and injured a 16-year-old and killed a 9-year-old. The 11-year-old has been charged with reckless murder and second-degree assault. There have not been any charges filed against the adult gun owner. 13 shootings in 7 days. These are not accidents. They are fully preventable tragedies that are the direct result of adult negligence. Every gun in a child’s hands must first pass through an adult’s. The single most important responsibility of being a gun owner is keeping guns out of the hands of children. Safe storage saves lives. 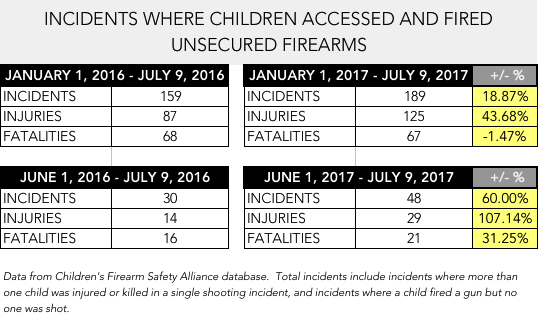 Data from the Children’s Firearm Safety Alliance (CFSA) database which uses news stories and police reports gathered by The Gun Violence Archive and news alerts. More information on individual cases can be found in the searchable CFSA database. Between June 14th and June 21st, there were at least NINE shootings involving children with access to loaded guns. Of those nine shootings, five resulted in fatalities. The youngest victim was a 3-year-old who fatally shot himself. Earlier this week, Pediatrics published a new study from the CDC on the number of children inured and killed each year by gunshots. According to the study, over 7,000 children each year are require medical attention after being shot – nearly 1300 children die and 5790 are treated for gunshot wounds each year. While many of these injuries and fatalities are related to homicide or attempted homicide, many are related to suicides (which showed a 60% increase from 2007 to 2014) and unintentional shootings. The shooter playing with a gun was the most common circumstance surrounding unintentional firearm deaths of both younger and older children. This is what a week of unintentional shootings involving kids with access to loaded, irresponsibly stored guns looks like. The shootings happen across the country, north, south, east, and west. They happen in rural, urban, and suburban areas, and to families of different ethnic and socioeconomic backgrounds. They happen when toddlers pick up a gun and when older kids who know better pick up a gun. Sometimes the child shoots themselves and sometimes the child shoots someone else, often a sibling or family member. The only common denominator in all of them is an adult gun owner’s negligent and reckless decision to leave their firearm unsecured. A 15-year-old unintentionally shot himself at a house to police. His condition is unknown. A 13-year-old boy died Monday after he shot himself in the head while playing with a gun. He was a friend’s house with other kids. Investigators have not said how the boys got the gun. A 4-year-old child gained access to a loaded gun and fatally shot himself in the head with it. A 16-year-old and his cousin were looking at a gun in Rosamond when it accidentally went off, striking the cousin of the 16-year-old. An 11-year-old boy was taken to the hospital after accidentally shooting himself in the eye at his home. He was taken to the hospital in grave condition. A 13-year-old and 22-year-old were fishing on a pond. The sheriff says the boy dropped a gun and it shot the man, who was also taken to the hospital for treatment. A 4-year-old girl was accidentally fatally wounded Friday by her 6-year-old sibling in Spartanburg, S.C. Officers who arrived at the scene said the victim’s 6-year-old sibling accidentally discharged a handgun and the bullet struck the 4-year-old. Three teens were hanging out in a garage and were handling a shotgun. According to the two survivors, the gun was placed on an appliance where it was knocked off, causing it to discharge, striking and killing one of the teens. No charges have been filed. For most families with kids and teens, May is an exciting month. Kids are planning graduations and proms, parents are planning vacations. The weather is warming up and parents and kids alike look forward to summer. But for at least three dozen families, May was a month of tragedy after their children came in contact with loaded, negligently stored firearms. In May, a month with 31 days, at least 37 children pulled a trigger and unintentionally shot themselves or another person. Each month this year, the number of these incidents has ticked up by one to two shootings, but in May, the number went up by nine. There were several days in May where there were multiple shootings involving kids with access to irresponsibly stored firearms. The youngest shooter was an 18-month-old in Tennessee who shot himself in the face. 2 children shot a sibling, 1 was killed. These types of shootings are very rare in some states. For example, between 2014 and 2016, Massachusetts, a state with safe storage laws, saw only 1 incident of a child fatally shot with an irresponsibly stored gun. On the other end of the spectrum, these shootings occur with alarming regularity in other states. In May, there were 30 states where there was not a single unintentional shooting involving a child with access to unsecured guns. The numbers for 2017 are up from 2016. Between January 1, 2016 and May 31, 2016, we logged 129 incidents. Between January 1, 2017 and May 31, 2017, we logged 138. Each one of these shootings was preventable. Every gun in a child’s hand must first pass through an adult. Gun violence is a complicated issue, but keeping guns stored responsibly is not complicated. There are a number of policies and recommendations that have been shown to reduce the number of these preventable tragedies. States with child access prevention and safe storage laws experience fewer of these types of shootings. Adult gun owners should be held responsible when their choice to leave a loaded gun unsecured results in a child’s injury or death. Laws that operate as a deterrent, such as DUI laws, work. While they may not prevent every incidents, they will prevent some and that’s significant, especially when prevention means fewer children shot and killed. Parents must be educated about the vital importance of storing guns responsibly. The most important responsibility of a gun owner, especially a gun owner with children, is to make absolutely certain that their gun does not end up in the wrong hands, including the hands of curious toddlers and young kids as well as tween and teens who are prone to making bad decisions. Parents must ask how guns are stored any place their child plays or spends time, whether it is a friend’s house or the home of a relative. Even if you store your guns responsibly (or don’t even have guns), never assume that other parents or family members do likewise. This may especially be true of friends and relatives who don’t have children. While it may feel awkward to ask, it’s better than losing a child. Pediatricians should be allowed to – and encouraged to – ask parents how they store firearms. This should be as routine as asking parents about car seats, pool safety, or smoke detectors. Talk to your children about firearms and what to do if they encounter them. Children should be taught not to ever touch or handle a gun unless they are under the direct supervision of an adult. Even if you don’t have guns, it’s still important for your kids to know what to do if they find one at a friend’s house or if a friend tries to to show them one that belongs to a parent or family member. HOWEVER, do not ever assume that teaching your children about gun safety is enough to keep them safe from an unintentional shooting. IT IS NOT. The onus on keeping kids safe is 100% on the adults in their lives. Simply telling a child “Stop. Don’t Touch. Tell an adult” is not an effective way of preventing these shootings. Numerous hidden camera studies conducted by behavioral psychologists have shown that kids, young kids through tweens and teens, are still very likely to pick up and handle a gun even after being trained to not touch and alert an adult. These incidents are not accidents. They are 100% preventable. Each and every one is the fault of an adult’s negligence and carelessness. Safe storage saves lives. Period. 13-year-old Andrew White was fatally shot in the chest while at a friend’s house. The police reported it to be a homicide but that they were not looking for suspects. The young boy’s family said the shooting was accidental. The boy was just days away from his 14th birthday. Several children, supervised by a teen, were playing with a gun they found. A 11-year-old boy thinking the gun was unloaded unintentionally shot a 10-year-old boy in the shoulder and arm. A 15-year-old girl riding in the back of a car unintentionally shot the 16-year-old female driver in the back. The 25-year-old gun owner was in the car with the girls and was charged with unlawfully allowing a minor to possess a gun. A 2-year-old boy found a gun in his home and shot and injured himself in the head. A 13-year-old girl was unintentionally shot in the stomach by a 12-year-old boy at their grandmothers house. She later died. The boy could be charged with unlawful use of a weapon and reckless conduct. A 16-year-old cleaning his gun unintentionally fired it, striking a 18-year-old male in the cheek. A nearby school lockdown occurred until it was determined where the gunfire came from. A 2-year-old found his father’s loaded gun and unintentionally shot himself. The father of the child was arrested and could face charges. A 3-year-old found a loaded handgun in a sofa and unintentionally shot himself in the face. A 17-year-old cleaning a high powered rifle unintentionally firing it, hitting a 14-year-old girl sleeping in an apartment three apartments away. A 13-year-old boy playing with a gun unintentionally shot a 12-year-old friend. They thought it was a toy gun. A 10-year-old boy unintentionally shot his 15-year-old brother in the face. He lated died. A 16-year-old unintentionally shot a 19-year-old friend in the leg. The victim is expected to survive. The shooter was charged with reckless endangerment, unlawful possession of firearm and theft of firearm. An 11-year-old boy was babysitting his younger brother at a home when he found a gun under a bed. He fired the weapon, striking his brother in the leg. The 4-year-old was taken to the hospital for treatment. He is expected to be okay. A 2-year-old was handling a loaded, unsecured gun and shot himself in the arm. The child’s cousin was babysitting him at the time and has been taken into custody. No word on what she will be charged with. A man was bathing his children around 2am. He took the 1-year-old out and placed him on a bed and left the room, The child found a loaded gun on the bed and fired it, grazing his face. The father was charged. A girl took the gun from her house to familiarize herself with it, and accidentally fired it while trying to “manipulate” the gun. She was treated at the scene then airlifted to a nearby hospital. No criminal charges have been filed in the case. A 6-year-old suffered a gunshot wound to the abdomen. Authorities believe that the injury was self-inflicted and unintentional. Adults and other children were home at the time. A 4-year-old boy shot and killed himself Monday afternoon with a gun he found at a residential child care provider, which is also the home of a Stafford County Deputy Sheriff. A 6-year-old child brought a loaded gun to school and dropped it. Another child picked up and fired it, striking a nearby 7-year-old. Two 9-year-olds were playing with a loaded 9mm gun when it discharged, striking one of the boys in the neck. The boy’s family claims the gun was locked but that the 9-year-olds were able to break it. Two 15-year-olds were handling a gun, when one of the teens accidentally shot the other in the stomach. The injured boy was airlifted and underwent surgery. He’s expected to recover. A 3-year-old boy died Friday after shooting himself with a gun he found in his family’s SUV outside their home. A 4-year-old boy, just days away from turning five, accidentally shot and killed himself early Thursday morning after finding a gun in his home. A 9-year-old had gotten off the bus from school shortly before gaining access to a gun and fatally shooting himself with it. A 15-year-old boy picked up a 9 mm pistol, accidentally causing it to fire. The teen was struck in the abdomen. Witnesses told deputies that a group of teenagers had three firearms, including the pistol, laying on a swivel stool. Several teens were playing with a gun in a barn when it discharged, shooting a 16-year-old in the head. Several teens had a gun in a car when it discharged, shooting a 15-year-old in the leg. They dropped him off at a home and left him there bleeding. Police are investigating. A 12-year-old boy was playing with a handgun, unloaded the magazine but didn’t clear the bullet in the chamber and shot himself in the head. He died later that night. A 2-year-old boy was unintentionally shot in the hand. An 8 year old boy found one of his parents loaded AK-47 in the trunk of a car and unintentionally shot himself in the leg. Three teen/tween friend were playing with a handgun when it unintentionally fired, killing a 12 year old. Three teen friend were playing with a handgun when it unintentionally fired, killing a 12 year old. The 13-year-old was charged with negligent homicide and a 12-year-old was charged with possession of a firearm. Two 15-year-old teens were playing with a handgun when it discharged, shooting one in the head. The 15-year-old shooter was charged with aggravated assault with deadly weapon. The adult gun owner, a resident in the home, was not charged. Two teens were pointing rifles at each other and one unintentionally fired, shooting the 17-year-old in the shoulder. Both teens from Smyrna face charges of reckless endangerment in the accidental shooting. A 17-year-old was playing with a gun in the backseat of a car and unintentionally shot a 23-year-old women in the back who was sitting in the car’s front seat. The 17-year-old was was arrested and charged with first degree reckless injury and possession of dangerous weapon by a person under 18. In the week leading to Mother’s Day, there were at least ELEVEN shooting incidents involving children with access to loaded and irresponsibly stored firearms. Of those, FOUR resulted in a child’s death. Four in just one week. The youngest fatality was a 3-year-old boy that shot himself with a gun found in the family SUV. Another was a 4-year-old boy just days away from celebrating his 5th birthday. Every single one of these shootings was the direct result of an adult’s choice to leave a loaded firearm unsecured. Every single one of these shootings was 100% preventable. Two 9-year-olds were playing with a loaded 9mm gun when it discharged, striking one of the boys in the neck. The boy’s family claims the gun was locked but the boys were able to break it. In the past week, there were AT LEAST 10 incidents of a child picking up a loaded, unsecured gun and shooting themselves or someone else with it. 3 children were killed. The youngest was two-years-old. 8 of the shooters were under the age of ten. 2 of the shooters were two-year-olds. 7 of the victims shot themselves. 3 shot a sibling. 9 of the shootings occurred in or around the victim’s home. 1 occurred in a school parking lot. 4 of the shootings happened over one weekend. So far this year, there have been AT LEAST 68 incidents where a child pulled the trigger of an irresponsibly stored gun, leading to the death of 23 children. March 25, 2017 – Columbia, SC – A four-year-old boy found a loaded, unsecured gun in his home and shot himself with it. The child was taken to the hospital and underwent surgery. No word on his condition. March 25, 2017 – Detroit, MI – A nine-year-old boy was looking in his mother’s purse for snacks when he found a loaded gun and shot himself in the hand. Two other children were in the home at the time. March 25, 2017 – High Point, NC – A two-year-old died after sustaining a gunshot wound to the head in what authorities report is an accidental shooting. March 24, 2017 – Richmond County, GA – A six-year-old little girl was left unattended inside the house while her father was outside the home with friends. She found his loaded .357 magnum revolver and shot herself with it. March 21, 2017 – Cana, VA – A nine-year-old girl was shot through the arm when another child was cleaning a loaded 9mm gun. Neighbors report that they had called authorities multiple times to report children in the yard playing with guns. March 21, 2017 – Mount Olivet, KY – A four-year-old found his uncle’s loaded gun in a truck, and pulled the trigger killing himself. The uncle is a police officer. March 20, 2017 – Detroit, MI – A fourteen-year-old was unintentionally shot by his ten-year-old brother as the two were playing with multiple gun at their grandparent’s home. At least one of the guns, a shotgun, was loaded. The fourteen-year-old was shot in the abdomen. He was hospitalized and underwent surgery. No word on his current condition. March 20, 2017 – Deltona, FL – A three-year-old boy found a .380-caliber Glock pistol in the truck of a woman supervising him and pulled the trigger. The bullet lodged in the side door. Fortunately, no one was injured. The shooting took place in a church school’s parking lot. March 20, 2017 – Phoenix, AZ – A nine-year-old boy was shot and killed by his two-year-old sibling. told police she had placed the 9mm handgun, which was unholstered and loaded, on the master bed, next to her 2- and 4-year-old sons. The mother said the 2-year-old picked up the gun and fired it, striking the 9-year-old as he played video games a few feet away. The woman told police the gun was not equipped with an external safety, and that on several occasions she had allowed the 2-year-old to practice pulling the trigger when the gun was unloaded. March 19, 2017 – Baton Rouge, LA – A five-year-old little girl unintentionally shot herself. Her condition is unknown. Law enforcement said they were unsure whether or not any charges would be filed.